The South Shore Memory Project began as a pilot project sponsored by the South Shore Foundation in August 1998. 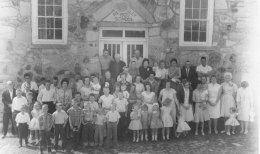 ASUMH developed a program, in partnership with the Flippin Public School System, that enabled children to document and preserve the local history and customs of the Ozark Mountains. To learn more about the project, read Allen C. Benson's article The South Shore Memory Project: Children Building Digital Libraries published in the April 2000 issue of "Arkansas Libraries," The official publication of the Arkansas Library Association.